Wine cellar building and technology go hand in hand in recent years, and FWC utilizes innovative technologies to boost the user experience and also the functional reliability of the wine cellars. One of the best examples for this is the state-of-the-art “Remote Monitoring System” which allows FWC to remotely monitor wine cellars equipped with this optional feature to ensure that all systems providing the ideal storage conditions in the cellar are always on the rails and in good working order. This stand-alone system composes of several wireless sensors monitoring not only the temperature and humidity level inside the cellar, also the temperature of the cool air supplied by the cooling system, the ambient temperature where the split condensing unit is located, and also a gateway communicating with the sensors wirelessly and transferring the readings collected by them to the FWC monitoring center over Internet. This cutting-edge system generates alarms when the temperature or humidity inside the cellar exceeds the desired range, or in case of any failure of the cooling system or power outage. Even if you keep the cellar door open for too long, the system notifies FWC’s technical department of this situation on 24/7 basis. Practical benefit of remote monitoring for the cellar owner is that any potential malfunction of the critical components of the cellar can be diagnosed before it happens, and responded by the FWC technical service teams even before the cellar owner becomes aware of the failure. 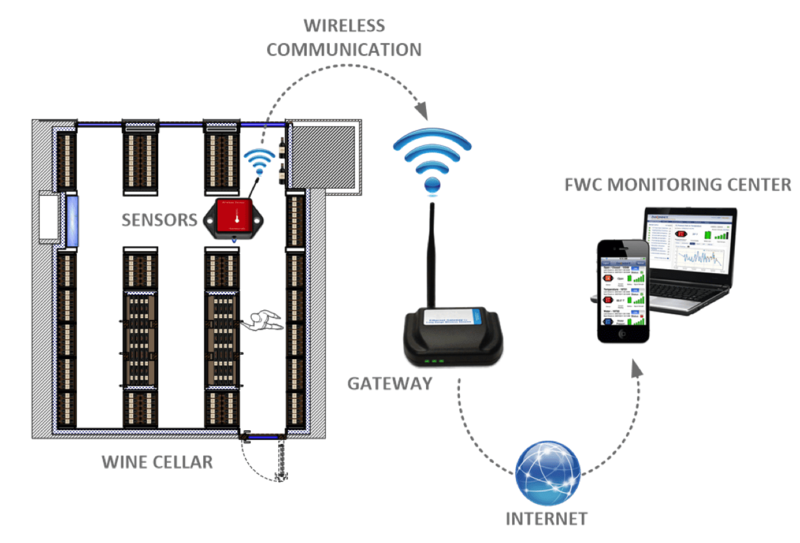 FWC is the industry leader in the use of remote monitoring systems in the wine cellars.